This one is a thin and flat lighter It looks real old, but I cannot find anything to tell me when it was made. It seems to be made so it can slip into a pack of cigarettes. When inspecting it you can tell it used to have white in those little grooves on the sides. There is some left on the back left side. You can't see it on the metal in the picture, but it has Winston Select engraved on it (both sides). 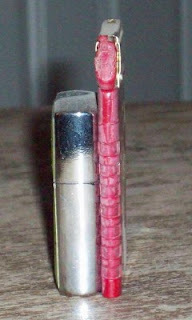 You can see how thin it is compared to a normal size Zippo. I have never tried to put fluid in it to see if it lights. I bet it would, everything sounds good when you dry light it. 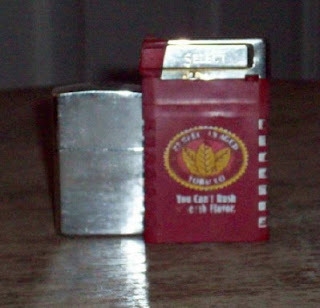 I have this same lighter for several years. I got it in a 3 pack winston select deal probably between 1990 - 1992. I am actually using it right now after a fresh refuel. I use this lighter for my bowl lighting and it never leaves my "stash box". This is why I have had all these years. Very dependable. Gas yours up and I bet it will fire up! not sure if this is a fill spot or not, but, on the top in front of where the flame appears, there is a small hole that may be the access point for adding fuel? That's all I can see on the one I own in excellent condition.